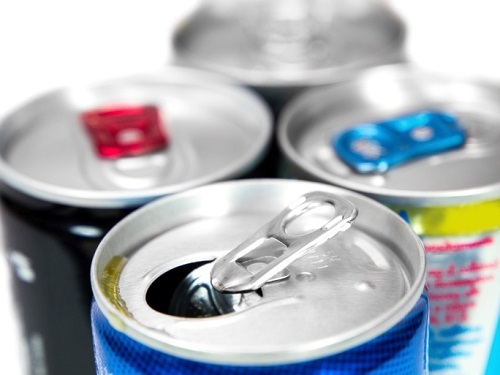 Drinking even one energy drink can have negative health effects, a new study suggests. The study, published in JAMA, found that drinking one can of the popular “Rockstar” energy drink could significantly increase blood pressure and certain stress hormones. The findings suggest that having energy drinks could raise the risk of developing heart disease, heart attacks, and strokes. Rockstar is one of the most popular energy drinks on the market, selling over 20 million cans each year. With a variety of different flavors and types, Rockstar is intended to provide a boost in energy and alertness. The drinks contain a number of different stimulants. The 16-ounce Rockstar drink used in the study contained 240 milligrams (mg) of caffeine, which is over twice the amount of caffeine in a single cup of coffee. The drink also contains another stimulant, taurine, which is thought to increase mental clarity and boost physical energy. The drink contains herbal extracts, including ginseng and milk thistle, which are thought to have some effect on the body. Researchers recruited 25 healthy people with no known health problems. They were given a Rockstar drink on one day and a placebo on another. Both their blood pressure and the levels of norepinephrine stress hormone were monitored before having the drink and 30 minutes afterwards. Compared to the placebo, the energy drink raised both blood pressure and norepinephrine levels significantly. Blood pressure was raised by 6.4%, compared to one percent for the placebo, and levels of norepinephrine were 74% higher, compared to 31% for the placebo. There was no difference in heartrate between the two groups. Norepinephrine is the stress hormone that is associated with the “fight or flight” stress response. While it increases mental alertness, it also raises blood pressure and affects the heart’s ability to contract. While high consumption of energy drinks have previously been linked to heart attacks, this study’s findings indicate that even regular use or smaller doses could have a negative health effect. Previous research has linked energy drinks to a variety of health problems, including an increased incidence of traumatic brain injury. While the latest study shows that energy drinks may be unhealthy, the researchers say that further studies will be necessary to confirm the link between the drinks and heart disease. As well, the study’s sample size of 25 people is too small to draw broad conclusions. However, Dr. Anna Svatikova, lead author on the study and a cardiologist with the Mayo Clinic, has stated that since the study used healthy volunteers, the effects could be even more pronounced in people suffering from blood pressure or heart problems. For these people, it may be in their best interest to skip even the occasional energy drink. Davies, M., “Just ONE energy drink a day may raise the risk of heart problems: Drink causes blood pressure and stress hormones to soar,” The Daily Mail web site, November 9, 2015; http://www.dailymail.co.uk/health/article-3310158/Just-ONE-energy-drink-day-raise-risk-heart-problems-Drink-causes-blood-pressure-stress-hormones-soar.html. Sifferlin, A., “Energy Drinks Raise Blood Pressure, Study Suggests,” TIME web site, November 9, 2015; http://time.com/4104765/energy-drinks-blood-pressure/. Simons, W., “New Study Suggests There Are Heart Risks Associated With Consuming Just One Energy Drink,” The Latest News web site, November 9, 2015; http://www.thelatestnews.com/new-study-suggests-that-there-are-heart-risks-associated-with-consuming-just-one-energy-drink/.